Not only can you make money from your music while running a promotion, you can make a decent living doing music business in Nigeria. In today’s world your songs can generate money and royalties via different streams, if only you knew and took the right steps in doing things right. I do receives emails and phone calls from many artists and new label owners seeking help on how to monetize their contents in this new music industry, each time I tweets about music monetization and sharing business tips. In line with that I will be focusing my write up on the business side of music and content monetization. Let me start by introducing myself for the benefit of those reading my write up for the first time. I am Femi Lawal by name popularly referred to as Femi.Megapoints ,while some call me the music business guy because all my write up are majorly focused on the business side of music and money making. My name may not ring bell to you but my work and signature is everywhere around and across the internet. By God grace I am the Co-founder of Mega Points International (Africa’s First Independent A&R/Promotion Company), Managing Director for Music2Deal Nigeria (www.music2deal.com), a music business networking community for the music industry, Co-founder of MBES- Music Business Entrepreneurship Sessions, organizer of the Music Saturdays event and Co-founder of Music Industry Media; publishers of “The Music Industry Newsletter”- a free music business focus publication, circulated to over a 100,000 worldwide professionals of the music business. The music industry is not about who you are but what you’ve done and what you are currently doing and how you are doing it. I have worked with and for many celebrity artistes in Nigeria, UK, US and different part of world. Enough of the introduction and back to the main topic of the day. If you want to know more about me Google the name FEMI LAWAL of Mega Points International or follow me on Twitter via @saintphemmy and Femi.Megapoints on Facebook. In 2014, my partners and I inaugurated the Music Business Entrepreneurship Sessions and I penned an official white paper on the state of the industry and the business of music for the event. I will be sharing some insights from that white paper in this write up today because it has to do with content monetization, which is still a major and important topic in music business today. The music business ecosystem dynamics has change, the audience has develops new habits and new technological tools are here. More artists and music professionals are subscribing to contemporary entrepreneurial approaches to stay relevant, creating artistic and commercial value and innovates. For the business of music to work potential scalable and sustainable new music business models need to be in play. The problem we’re facing in our music industry is the problem of education. Many in the Nigerian music industry have no formal knowledge on the business side of music thus making it difficult to have a developed industry. 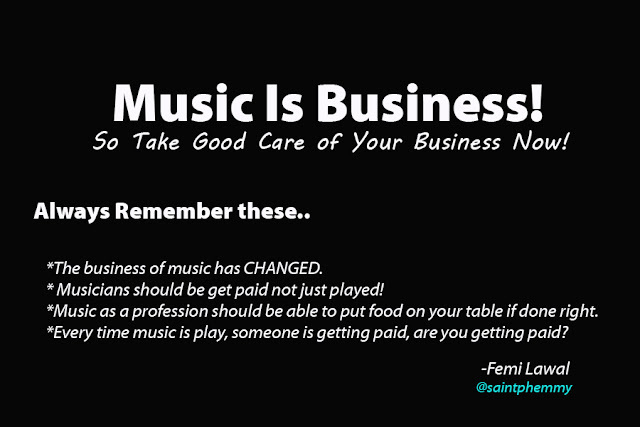 Quote me right; what I am trying to say is that many need to be educated about the business side of music. Not everyone in the music industry is actually doing the music business. Talks on music business is not what we can round up in just one write up, we will talking about it every time because it has to do with everything music and making money. If you’re into music and you are not doing the business then you have to quit and stop wasting your time and resources. Music is a business, so if you’re doing music you need to earn a living from it. The basic truth of music business is every time or anywhere music is played someone is getting paid and it’s necessarily not the artist or song writer. When radio stations play your song someone is getting paid, the question now is are you getting paid or just getting played? If you have a song on radio or video on TV and you’re not getting royalties feel free to get in touch with me. Like I said music is a business and while you’re investing your hard earned money on the business, you need to get returns on your investments. The funny statement I usually hear from artist and new label owners are; “Will they play our music again, if we join a collective society for royalties’ collection on our song spins and usage”. The truth is you will get played if your music is good and if you’re running the payola package with the Djs or OAPs. The fact is either you join or not you have a royalty that is being shared among other members of the collective society. If you need help or more information on this get in touch with me. Getting paid from your music is beyond just the radio spins royalties. The collective society collects money from hotels, event venues and corporate establishments that uses music as part of their business. The list goes on, from advertising agencies running outdoor activation activities, night clubs, airlines etc. Like it is in every industry across the globe about content monetization so it is here in Nigeria too. The only difference is we’re just entering the digitalization era while other industries like the UK and US are finding new revenue streams we are still trying to understand how it can work. I am talking about content monetization via the internet and mobile. Gradually our industry is catching up but education is needed to develop the industry here in Nigeria. The fast rising artists need to be carry along in all developmental moves. Initiatives and platforms like MTN Music Plus, Techno Boom Player app, Etisalat’s Cloud 9 and music stores like Spinlet… are few of the many other revenue streams for any musicians and label that want to be in the business. If you need help on this also, don’t hesitate to get in touch with me. My company event ‘The Music Business Entrepreneurship Sessions’ was initiated with the goal of educating attendees about the new global music business industry and many advantages in the digital era, exposing independent artists and new label owners to the new global music business marketplace and developing an outlet that will allow independent artists and new labels to be successful. In my journey as a music business consultant, Director of A&R and PR executive, I have consults for many Independent artistes and label owners who have wasted millions of naira on unfruitful projects before our meetings. I would have love to share one of the stories with you but there is no time for that now. Let me quickly give words on content monetization in Nigeria. Do you know it’s easy to monetize your music and video while running a promotional campaign on a new project? All you need do is crafting a proper media planning and placing your contents on platforms where it can be monetize other than just putting it up on blog for free downloads alone. Don’t get me wrong, I know you are a new label or a new artist and you need people to know your music. Yes there are ways it can be run strategically; having the songs on blogs and still promoting your sales links. I will be glad to mentor or consults for you on this if you are interested. I remember telling a client, we are promoting only the sales link of his new single on social network and no retweets to any blog post just favorites. He was like no, that can’t work. How will people download my song? I am a new artist, seeking fans so I need more downloads. After explaining the working trends on the project to him he said ok let us give it a trial. We had several blogs posted the new song, we have it on several streaming and digital sales platform too. We only tweets and promote the link of where the song can be streams or download on purchase by his followers and friends on all his social networks. Sign him up with the relevant collective society for radio airplay royalties. Three months after the new single release and campaign the total income streams from the project contributed at least 45% of what he used to shoot his music video. One thing most new artistes and the new labels forget is; Free downloads doesn’t mean the song will get popular, it’s the media plan and strategies used to push the song and the release timing. Promotion doesn’t give guarantee of getting know or popular but publicity does and it can give you visibility to a great extent than just running promotion without innovative publicity plan mapped out to go alongside with the promotion. I will say just do your business, release your song on blogs for free if you want and still pushes your sale links on all your social networks. Remember you have other songs to release if the first release did not become a hit as expected by you. Without no content monetization plan in place, you will still have to find or fund the next single release or video alone without any form of revenue from your previous releases. Imagine running this repeatedly every time you are to release a song. Make smarter moves, learn more about the business of music and new trends. Mobile sales is getting bigger by the day as it is the future. Don’t be left out. I have more things to write about but let’s leave that till my next write-up. If you need help, mentorship or interested in running a music business consultation with me, let us connect on social media @saintphemmy on Twitter, Femi.Megapoints on Facebook, Femi Lawal on LinkedIn. Whatsapp me via 07031611402 and Call or text me via 09095616869. Share the good news of music and monetization with every musician and label owners you know. Thanks.